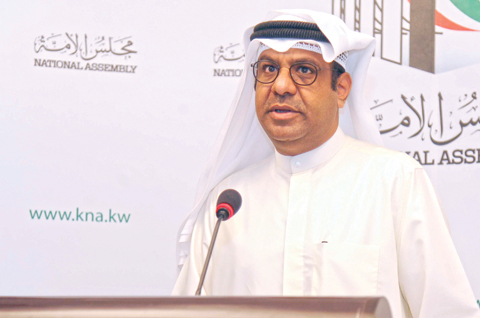 KUWAIT: Former MP Ahmad Al-Qudhaibi said yesterday that by delaying the application of the anti-corruption legislation, the government has effectively promoted corruption. The government was supposed to have issued bylaws necessary for the anti-corruption law to become effective seven months ago, but it did not, the former lawmaker, who is bidding for re-election, said. One week before the National Assembly was dissolved, Qudhaibi submitted a request to grill former justice minister Yaqoub Al-Sane for failing to issue the bylaws. The grilling was not debated because the Assembly was dissolved. Failure to implement the anti-corruption law means that former MPs, ministers and senior government bureaucrats were saved from the mandatory submission of their wealth disclosures, said Qudhaibi, adding that “there are some who are trying to protect corrupt politicians and declare them innocent”. The former lawmaker said that he had warned against holding the Assembly election before issuing the bylaws and applying the anti-corruption law, and questioned if the government wants to protect its candidates in the polls and give them funds without being blamed for interfering in election. Qudhaibi said that establishing the Anti-Corruption Authority was one of the major political reform achievements by the dissolved Assembly, but it remained lacking without it becoming effective. He said that if he gets elected, he plans to submit another grilling of the new justice minister over the same issue. Former opposition MP and election candidate Al-Saifi Al-Saifi yesterday strongly criticized the government for revoking the citizenship of several opposition figures, saying that the government had done a great injustice to several Kuwaiti families. He said that the government had revoked the citizenships through a decision and can restore them also through a decision. Saifi said the opposition does not plan to create tensions with the government, but if it does not restore those citizenships, he vowed the opposition lawmakers will not remain silent, adding that “we will not rest until the citizenships were returned”. The former lawmaker warned over the possibility of the government rigging the election like what it did way back in 1967 or by funding some candidates. Saifi called on Kuwaiti voters to take part in the coming election in large numbers in order to ensure that the best people are elected to serve the country and citizens. Former MP Nasser Al-Marri, running from the fifth district, said the government is looking for a flexible Assembly in a bid to pass its harsh austerity program, adding the dangers of random decisions are greater than those resulting from the fall in oil prices. He held the government responsible for the deterioration in the economic situation and said citizens should not be made to bear the results of its mistakes. He said that economic reforms should start from the government and wealthy people and not from low-income sections. Marri said that “touristic” medical treatment abroad in the past few years cost KD 1.48 billion, which is enough to build several hospitals in the country.